All our programs are offered at the UNC Charlotte Center City, where you’ll reap the benefits of a hands-on classroom experience. With 143,000 sq. feet, 25 classrooms and design studios, meeting and performance spaces, an art gallery, and a four-acre park, all near light rail, it speaks to a new vision in higher education. A vision that includes urban education, research, engagement, and sustainability. 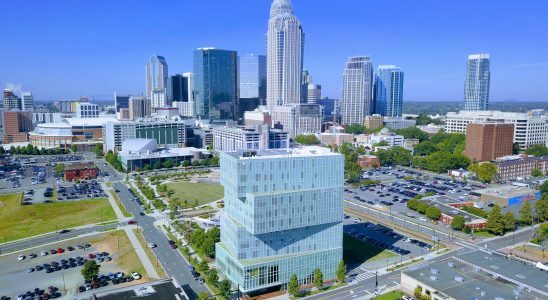 UNC Charlotte Center City is the only University of North Carolina building conceived and designed specifically to serve the people, organizations, and businesses of the urban center. It provides UNC Charlotte with an enduring presence in the city’s business and cultural district, bringing the University’s considerable intellectual resources to the heart of the Charlotte community. It’s a place where you can work on your MBA, your professional Continuing Education requirements, or your Uptown network, all in a space that’s designed to connect you to the most exciting urban center in the state. Parking: Metered parking spaces and pay-to-park garages and lots are within walking distance of UNC Charlotte Center City. Learn more about UNC Charlotte Boot Camps by filling out the form below.